It’s Thursday afternoon, and the sun is shining. Customers stream into the North Berkeley Farmers' Market from all directions. Some lock their bicycles to parking meters behind the vendors’ tents while others have parked nearby or come on foot. Patrons stroll from one artfully decorated booth to the next, sampling peaches in the summertime and apples in the fall. Approximately 15 canopy-covered stalls fill a blocked-off city street, facing inward toward a grassy, tree-lined median. Beneath the farmers’ tents lies a cornucopia of fresh food. The winter crops are mostly green—spinach, lettuce, cabbage, chard and kale—though carrots, oranges, and beets add splashes of color. Summertime is a rainbow of tomatoes, summer squash, strawberries, melons, and peppers. Patrons strolling through the market are surrounded by snippets of casual conversation. Friends and neighbors greet one another, warmly inquiring about families and common friends. Some seem to have run across each other unexpectedly while others have planned their meetings. Many visitors, especially women and young children, sit on the grass and savor their purchases. At the various booths, customers joyfully share nutrition advice and food preparation techniques, or else probe farmers about their cultivation practices. Farmers tend to enjoy the social interaction. One farmer, for example, describes her pride in the compliments she receives: “People say the most incredibly generous things about your food,” she says, “Like, ‘that was the best meal I’ve ever eaten’ or ‘thank you so much for doing this work.’ Just the joy,” she continues, pausing for a moment. “I mean, around food is such a pure kind of wonderful joy! People are so supportive!” Other vendors, as well as managers and customers, often echo the sense of warmth and connection conveyed by this farmer, commonly describing the North Berkeley Farmers’ Market as sociable and relaxed, with a slower pace than other area markets and grocery stores. 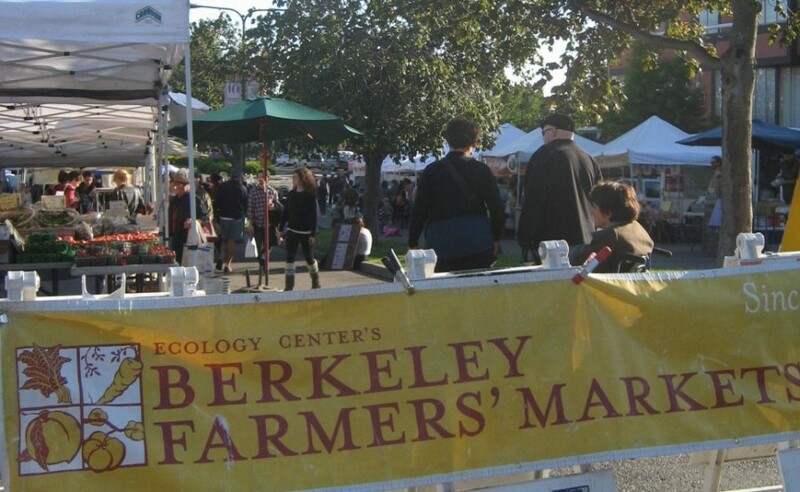 Founded in 2003, North Berkeley is the most recent addition to the Berkeley Farmers’ Market landscape. Like its predecessors in South and Downtown Berkeley, it is managed by The Ecology Center, one of the city’s veteran environmental organizations. Since 1969, The Ecology Center has run a variety of urban sustainability initiatives including Berkeley’s Curbside Recycling program, the first in the country. While many farmers’ markets are associated with environmental themes, The Ecology Center ensures that this is the focal point of their farmers’ markets. Its bylaws allow only organic produce from local growers, and all but one of its farmers come from within 150 miles of Berkeley. Prepared foods must be at least 80% organic, use local ingredients whenever possible, and be served on compostable plates. The North Berkeley Farmers’ Market is also extremely profitable for vendors. On the rare occasion that a space becomes available, potential applicants are evaluated on environmental considerations including organic techniques and the miles the food will travel. Proponents of this farmers’ market tend to view the buying and selling of local organic produce as an environmental good because it decreases dependence on the fossil fuels necessary for transport, pest and disease management, and fertilizer. Vendor Antonio Magana, who sells vegan Mexican food, embodies this sentiment when he declares “every time you come to my stand you’re part of the change.” This link between sustainable products and social change is important beyond food politics. It is the cornerstone of broad efforts to address environmental and social issues through ethical consumption. Despite the presence of Latin@s, African Americans, and Asian Americans, the North Berkeley Farmers’ Market is largely affluent and white. It takes place in the so-called “Gourmet Ghetto,” a striking name given that its high-end boutiques and restaurants are the antithesis of the poverty the word “ghetto” implies. Many of the surrounding restaurants share the Farmers’ Market’s penchant for local and organic food—within a few blocks shoppers can find products ranging from organic pizza with seasonal toppings to biodynamic wine. The best-known neighborhood stalwart is Alice Waters’ Chez Panisse, which was among the first restaurants in the nation to feature local and organic foods and to highlight the contributions of farmers. Chez Panisse is widely thought of as the birthplace of “California cuisine,” which fuses French-inspired techniques with fresh and seasonal ingredients, and is increasingly popular both within and beyond Berkeley. The Farmers’ Market’s Gourmet Ghetto location imbues it with a sense of bohemian elegance that is simultaneously affluent and countercultural. The affluent character of this farmers market is seemingly at odds with its dedication to social justice. And yet, the Ecology Center works to ensure that Farmers’ Market produce is widely available. “Sustainability is about the three E’s––environment, economy and equity,” said Executive Director Martin Borque “We need to ensure that equity remains a part of what we’re working for.” Additionally, the Ecology Center’s commitment to equity goes beyond its rhetoric. Proceeds from the farmers market support Farm Fresh Choice, a project designed to increase access to healthy food in low-income communities and communities of color. The program hires black and Latino/a youth from low-income parts of Berkeley to purchase produce from market farmers at bulk discounted rates, and then to resell it at stands in their neighborhoods. Market managers proudly refer to Farm Fresh Choice as the farmers market’s “sister program.” However, Farm Fresh Choice takes place outside the physical boundaries of the market, and not all customers are even aware of it. The North Berkeley Farmers’ Market’s location in an affluent, predominantly white neighborhood feeds into the perception by some that local organic food is a luxury good.